On December 19, the Film Noir Foundation put together an early holiday gift for fans of film noir. In celebration of the season as well as the release of the official schedule for Noir City in January, the foundation held a showing of two noir-related films at the Castro Theatre in San Francisco. The first, Holiday Affair, is more in the spirit of the season while Lady in the Lake is a textbook noir–with a twist. 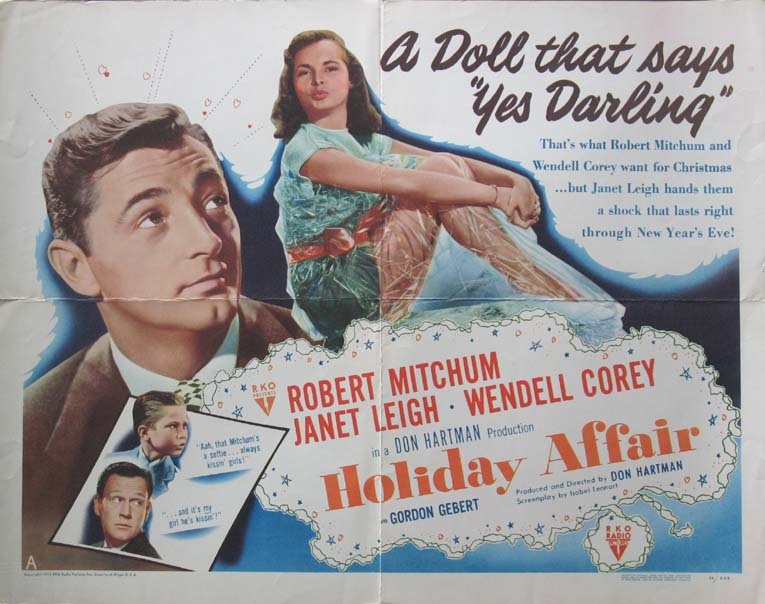 Holiday Affair stars Janet Leigh as Connie, a young war widow who meets and falls in love with Steve (Robert Mitchum), a toy salesman, despite being affianced to Carl (Wendell Corey), a rather straight-laced lawyer. Her young son much prefers Steve, and this puts a further strain on the relationship between Carl and Connie. It is clear that Carl is a good soul, but he is ultimately powerless to stop that which is going on between Steve and Connie. In an introduction given by Eddie Muller at the start of the film, Muller noted that this movie was chosen due to its holiday theme as well as the casting of Robert Mitchum as Steve. Mitchum was a very versatile actor, but especially beloved for his work in film noir. In Holiday Affair, however, he shows off his comedic skill. The movie would be classified as a romantic comedy above all, with solid performances by all involved but especially noteworthy is Gordon Gebert, the 8-year-old child actor who plays Connie’s son. Gebert shows an unusually wide range of emotion throughout the movie, and ends up being the driving force behind the whole story. After the film ended, Eddie Muller provided an update on Gebert–he is still with us, and currently the professor of Architecture at City College of New York. Gebert with Robert Mitchum in the film. After a brief intermission, Muller got up to introduce the second feature of the evening, an unquestionably noir thriller entitled Lady in the Lake. Starring Robert Montgomery and Audrey Totter, this story about a detective turned writer who gets involved in a murder mystery is one of the most experimental movies of the 1940’s. Montgomery, both star and director, decided to film the entire movie from the perspective of the main character, which paves the way for some very creative cinematic choices–including, most interestingly, the fact that the only time we ever see Montgomery’s character is through his reflection in the mirror. In addition, there are some very dramatic and action-packed scenes that normally would be helped along with corresponding music, but Montgomery preferred to let the scenes speak for themselves–Lady in the Lake has no musical score. Still, it was wonderful to see the movie after hearing so much about it, and the entire evening was great fun. Backlots will be returning to Noir City for the full festival in January, so stay tuned for more coverage! Really good stuff, Lara! I love those movies, and that picture of Mitchum with his hat perched on his head is a hoot! I LOVE the Noir City poster – boy I’d love to have that to hang on a wall! Thanks so much for sharing this with us. I’m always jealous that you get such great film festivals, events there in San Fran but I’m also happy for you. One of the many things I miss about that wonderful city. Happy New Year to you and enjoy the Film Noir Festival. I would love to see recent photos of The Castro Theatre.